Creating a budget is no fun. It’s even worse if you’ve never actually created a budget before and this is your first time. It’s a bit intimidating. You’re dealing with all of your money, expenses, bills, and income to try to come up with a clear picture of where your money is going. If you’re like most people, the sheer volume of transactions you make on a monthly basis can scare you away from ever sitting down to tackle a budget, but it doesn’t have to be that way. For you first-timers, here’s how you can get started today without making it seem like a chore. For most people, this will account for the bulk of your spending and the numbers are easy to find. So, go ahead and take a few minutes to jot down these major spending categories and tally them up. Good. Now, add another line item for your net monthly income. Alright, you’re already well on your way. Take your net income and subtract the total from the items above. Hopefully you end up with a positive number. This is now what’s leftover to work with when creating a more detailed budget. It will contain your discretionary spending, or in other words, spending that can easily be adjusted. The basic budget above is a great start and once you’ve done that it won’t seem nearly as intimidating to dig a little deeper. But the details are incredibly important because that’s where most of the damage can be done. Here you may spot trends and discover areas where you’re spending way too much. There are two ways to begin categorizing these expenses. If you use credit/debit almost exclusively it’s an easy job. Just go online or pull out your most recent statement and look through the transaction list making a note of what spending category it falls under. You’ll want to create categories such as dining out, general shopping, clothing, gifts, subscription services, etc. If you have a lot of cash transactions this can be a little harder. With cash you don’t have transactions easily compiled for you so you’ll need to save your receipts or jot down what you spent money on as you spend it so you can keep track. Regardless of which method you use it’s important to be as detailed as possible so you get a clear picture of where your money is going. The good news is after doing it the first time you’ll have a pretty good idea of what you’re spending money on and it will be much easier going forward. 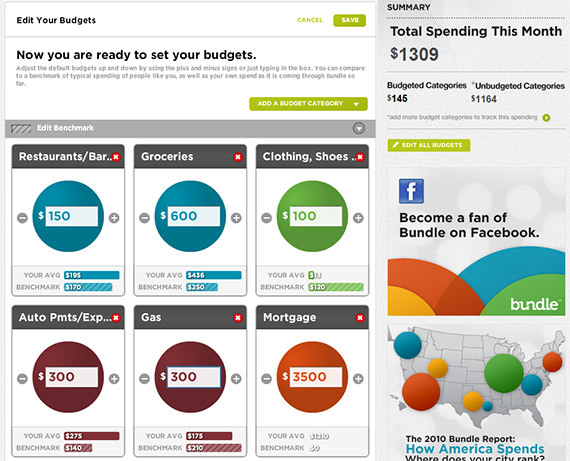 Thanks to the internet it’s easier than ever to keep tabs on your budget. In fact, many of the sites will also allow you to link directly with your checking account and credit card and automatically pull in your spending data and categorize it for you. That’s right, toss out the pad of paper and cumbersome spreadsheets because you can literally have a budget on your screen with just a few clicks of the mouse. My favorite budgeting tool has to be Bundle.com. It’s completely free and so simple to use. I recently did a detailed review of Bundle so if you want more information about how to use it I’d check that out. Basically, Bundle takes data from your linked accounts and categorizes them appropriately if it can. I found it correctly recognized about 80% of my transactions so I only had to manually categorize a few. It then takes that data and visually interprets the data so that just a quick glance gives you a clear (and sometimes shocking) picture of where your money is going. Create an account for free at bundle.com and begin budgeting today. To go one step further they have introduced some additional features that allow you to create your own customized saving goals and budgets for each individual category. And since it is constantly syncing your data you can literally go to the site any time and get an instant snapshot of how your monthly spending is going. 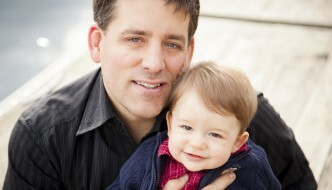 The other big budgeting site out there is Mint.com which is now a part of Intuit, the makers of Quicken and TurboTax. Like Bundle, you can link up your accounts and pull in most of the data automatically. The data is displayed in a more traditional fashion with pie charts and graphs, but it’s incredibly useful. Here too you can also set various savings goals and customized alerts to help you stay on top of your money. And if you’re someone who is always on the go, they have a really nice mobile app to put your budget in the palm of your hand. I’d highly recommend either of these free budgeting tools as it makes the whole process much easier than you can imagine. It’s great if this is your first budget since it takes a lot of the tedious work out of it. I’ll be the first person to admit that I’m not a huge budget person. What I didn’t realize is that it was my lack of a budget many years ago that got me into so much financial trouble to begin with. In college and a few years following, I just winged it. I thought I had a pretty good idea of where my money was going so I just let it be. Well, after doing this for a number of years the debt started to get out of control. It wasn’t like I was buying thousand dollar items on my credit card for fun, but because I wasn’t budgeting and barely keeping track of what I was buying along with only making the minimum credit card payments it spiraled out of control. After finally feeling the pressure of the added debt and realizing I was squandering my money away I got serious about my money and even sought out the help of a debt counselor. They worked with me to create a detailed budget, which up to that point I had never done before, and we identified many problem areas. Simply sitting down and taking a look at where my money was going I was able to free up a few hundred dollars each month without drastically changing my lifestyle. Now, instead of just getting by with minimum payments I was aggressively putting extra money towards the debt. Long story short, I managed to pay off tens of thousands of dollars in credit card debt in just three years. Had I continued down the same path any longer and I may have created a debt hole so deep I could have never escaped. But all I had to do was create a budget once and it opened my eyes. Budgets aren’t just for people struggling with debt. Anyone who wants to maximize the money they do have can stand to track their spending better. After a while you won’t have to track your budget nearly as close as you did initially. Your spending changes eventually become habit and you allocate your resources better without even thinking about it. That’s why even though I’m no longer scraping together money each month just to make my minimum credit card payments, I still like to keep my accounts up to date in Bundle so I can check in once a month and just see how I’m doing or see if any new trends are emerging I should be aware of. So, if you’ve never created a budget before, take a few minutes to try one. You don’t have to slave over every detail and make it another chore you’d rather avoid. Try one of the online budget tools mentioned above and really streamline the process. Think about it. If it takes you 30 minutes to set up your budget once and by doing so you identify $50 a month that can be spent better, it has already paid for itself many times over. A considerable portion of my income is being consumed by Taxes which hampers my monthly budget. Please guide regading how can I save on Taxes. I've always wanted to use an online budgeting tool that pulls in data from my accounts, but I have not been able to find one that works with ALL of my financial institutions. I tried Bundle today and it can't access my ING accounts, which is what we primarily use. Until then, we will keep using our own spreadsheets! I set up my budget using my online banking and Mint. I use plastic almost always as a way to kind of keep a tally of how much I'm spending and what I'm spending it on. I just implemented the budget a few weeks ago but hoping to keep fine tuning it as time goes on.